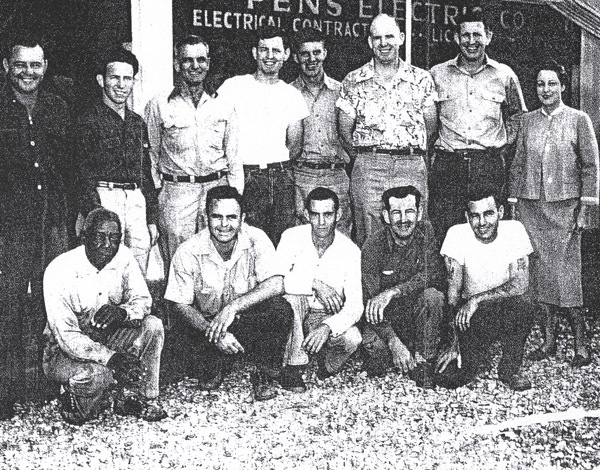 B&D Electric Company was formed in 1966, and has proudly served Baton Rouge and the Gulf South for 50 years. We are proud to provide quality electrical work and believe our customer service sets us apart from our competitors. In an ever-changing industry and community, B&D consistently provides excellent customer service and maintains a high standard of work that honors our past and looks forward to the challenges ahead. In 1966 two brothers, R.V. (Buddy), and J.A. (Doodle) Pendarvis created B&D Electric; the title stemming from the first letters of their nicknames, hence, “B&D”. The company was based at Doodle’s home in Walker, La. These two men were raised in the country and had learned early in life the value and necessity of hard work. After both serving in the military and working for an uncle in the electrical field, they decided to try and realize their dream of owning and operating a business they could call their own. It started slowly, hiring a few hard-working men that valued integrity and quality workmanship, but the business grew steadily. As the reputation of B&D grew, the company was able to expand, and eventually relocated to Baton Rouge on Darryl Drive. The company continued to progress, and maintained a high standard that clients came to expect and appreciate. During this time Buddy and Doodle were very active in the business, striving to make it successful and were determined not to let the quality of work diminish in any regard. These men had made their names and reputations their livelihood, and neither wanted the company’s name to be seen in any way other than positive. Both men had families and when the time came, each of the men’s children worked in some role at the company. This is a tradition that continues to this day, with children and grandchildren of Buddy and Doodle proudly working for the company they founded. By the mid-70’s, B&D Electric had been so successful that two other companies had been formed under the B&D umbrella, B&D Plumbing, and B&D Heating and Air Conditioning. The company was bursting at the seams, and it was time to expand. Property was bought along O’Neal Lane in Baton Rouge to house all 3 companies as well as a large warehouse to better serve the growing population of Baton Rouge. Now, three decades later, we are still growing. We continue to strive to meet the changing needs of our customer base and to continue to provide quality electrical service for Baton Rouge and its surrounding areas. We look forward to being able to serve you more efficiently online as well as in person. Please take time and view our site. It contains photos and more information about us. We are proud to uphold the standards of Buddy and Doodle, and hard work and integrity still come first in our vocabulary just as it did over fifty years ago.